We presented them “Wooden toy blocks of forest animals” from our boutique “LST BOTAN”. 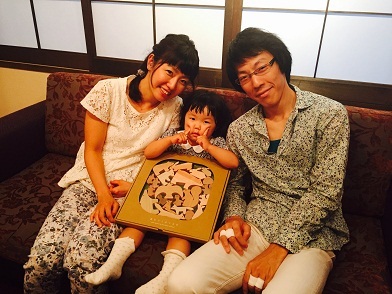 We found it was a good choice as they had not bought any wooden blocks for Azusa yet. 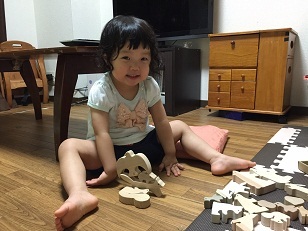 Later, they emailed us a picture of Azusa playing happily with the blocks at home and we could see that she liked them very much. 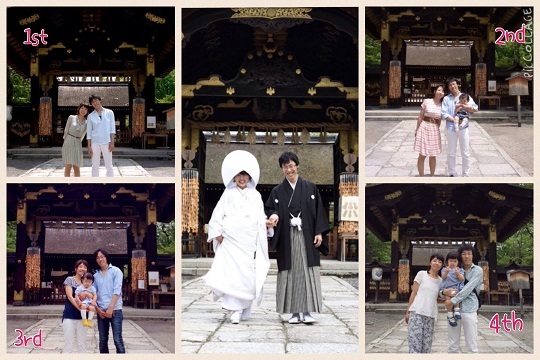 They also sent us some pictures taken at Toyokuni shrine as usual. Toyokuni shrine is the place where they got married. Mr. and Mrs. Y who had got married in June four years ago visited LST salon the other day. They came back to see us on their anniversary every year. So it has been a year since I had met them last time. Their daughter, Azusa turned to two years old and is grown to a pretty girl. We enjoyed talking about each other’s everyday life and discussing how to raise our children, and the time passed by so quickly. I was impressed with this word realizing that the family is also growing every year. We are so thankful to Mr. and Mrs. Y for coming back to see us every year. It’s great to say “See you next year!” to each other. We are looking forward to seeing you again next year, Mr. and Mrs. Y!